Prominent astrophysicist Neil deGrasse Tyson has a suggestion for anyone with a view of next week's solar eclipse: Put down your smartphone and take in the phenomenon yourself. The Aug. 21 event will be the first total solar eclipse in 99 years to cross a coast-to-coast swath of the United States. A total solar eclipse happens when the moon passes between the earth and the sun, completely blotting out the sunlight. Tyson, the director of the museum's Hayden Planetarium and host of the podcast "StarTalk," said missing the eclipse "would be to not live as full a life as you could have"—and having a video of it doesn't match watching it happen. "I get it—you want to look at it later. 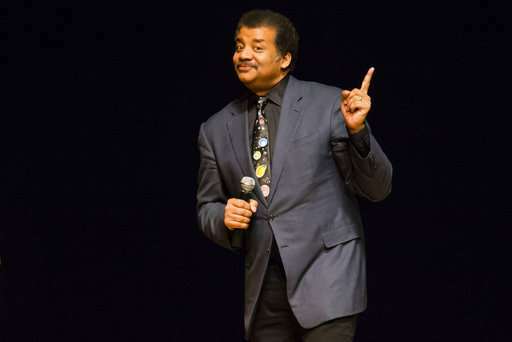 But then you would not have experienced it in the moment," said Tyson, who also has appeared on the CBS sitcom "The Big Bang Theory." His remarks resonated with Hanneke Weitering, who's traveling from Brooklyn to Nashville, Tennessee, to watch the eclipse. The 24-year-old marked the date in her calendar as a college undergraduate. "I've been looking forward to it ever since," she said. For those unable to buy special glasses to view the sun safely, Tyson, recommends holding a spaghetti strainer to the ground and looking at the images it creates below, like a pinhole camera. And however one views it, "recognize that, occasionally, things line up in ways that are uncommon or unusual, either in your life experience or for the earth itself," he said.